The history of architecture is filled with visionary projects that seek to solve social problems. Such utopian schemes frequently explore multi-family residences, institutional architecture or urban planning. The single family house has also served as both a spatial and social test-bed for a number of historically significant architects. Many contemporary architects of single-family houses, however, limit their ambitions to designing for another utopian construct – that of the harmonious nuclear family. Yet when reality confronts unfettered imagination – be it an ideal home or a utopia – another factor swiftly enters the equation: the compromise. Within the Western cult of the individual (not least within Western art and culture), compromise is generally regarded as being negative – a limitation imposed on individual and artistic freedom. In Sweden, however, compromise has played a key political role in the development of the Welfare State since the 1930s, where the so-called ‘Swedish Model’ can be said to be the result of a number of decisive compromises e.g., between capitalism and socialism, the individual and the collective, private and public. An important cornerstone of the Swedish welfarestate was the new aesthetic – “Functionalism” – that was launched at the Stockholm Exhibition in 1930. But the Swedish version of the modernist claim that “form follows function” never really made itself felt in the industrial art sector to the extent that it did in architecture and town planning. In these latter fields a radical, functional aesthetic in association with an equally radical policy of distribution could be centrally directed. But it was more difficult to persuade the citizens to buy the new, plainly functional furniture and porcelain. The internationally established concepts of “Swedish Modern” and “Scandinavian Design” rather describe an aesthetic that is characterized by a compromise between “functionalists” and “traditionalists” in which the radically functional was fused with the formally aesthetic. What combined this “Swedish aesthetic model”, with its willingness to compromise, with the uncompromising functionalism was a belief in the moral contribution of aesthetics to the “new men and women” who were to be characterized by both good taste and moral virtue. The Compromise House is a project which intends to re-evaluate the concept of compromise, where compromise is not regarded as a capitulation of principles or visions, but rather as a radical, innovative and experimentally creative principle which is explored in every aspect of the project, from spatial to social solutions. Conceptual diagram of the various compromises that were conducted. Diagram by Mårten Nettelblad. As a point of departure for the exploration of the concept of compromise, the antithesis of the compromise has been studied: the ideal. 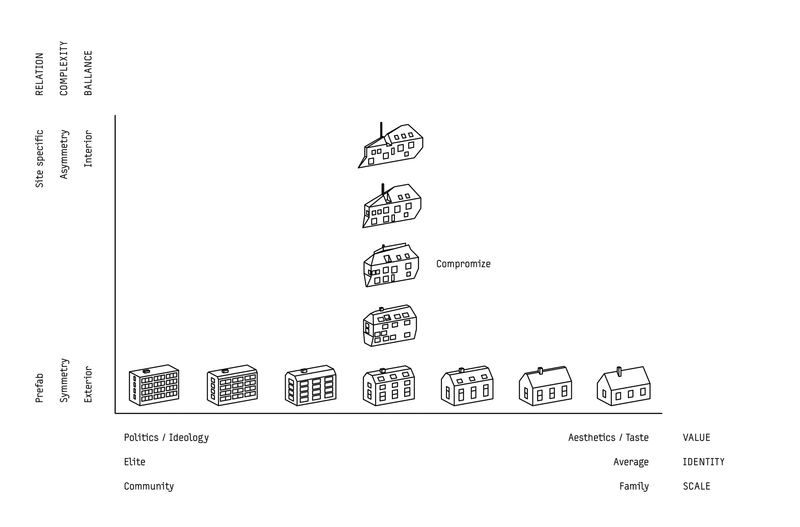 A series of case studies on various ideal architectural and social models have been conducted. Thereafter a number of “experimental compromises” between contrary and sometimes conflicting ideal models have been performed. These have subsequently resulted in new unexpected architectural as well as social solutions. In contrast to consensual modes of thought, forms of conflict and resistance, as well as practical problems, were viewed not as obstacles, but as creative elements to be integrated within the process itself. The Compromise House could be described as ‘Magic Functionalism’ — a compromise between ‘Functionalism’ * (the Scandinavian version of the International Style, which aimed to revolutionize life through function) and the literary style ‘Magic Realism’, which blends realism with elements of the bizarre, surreal and fantastic. The design process of The Compromise House, including research and experiments, started in 1999 and lasted until 2008 when the construction of the house began. The house remains a work-in-progress, with continuous development and improvement, conceptually as well as architecturally. The Compromise House is built in Mörtnäs in the archipelago outside Stockholm, and serves as the home and studio of Måns Wrange and his family. Design” rather describe an aesthetic that is characterized by a compromise between “functionalists” and “traditionalists” in which the radically functional was fused with the formally aesthetic. What combined this “Swedish aesthetic model”, with its willingness to compromise, with the uncompromising functionalism was a belief in the moral contribution of aesthetics to the “new men and women” who were to be characterized by both good taste and moral virtue. The compromise as a creative principle has not only been used in architectual solutions of The Compromise House, but also in the design process of the furniture and other objects in the house. Below is one example of works. 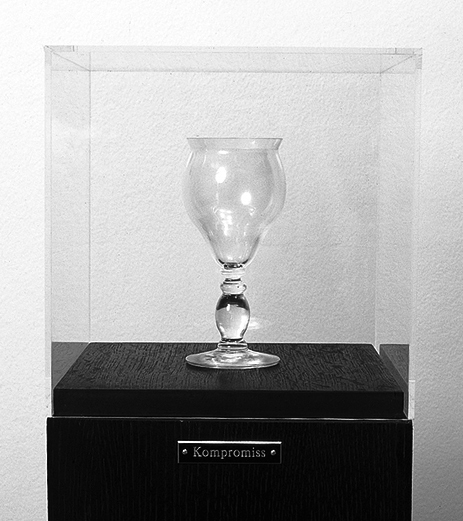 Compromise (Haga/Harpsund/Saltsjöbaden), various sizes, hand blown glass and framed black and white photographs, 1999. The first work in the Compromise House project is a hand blown glass with the IKEA sounding name Compromise – Haga/Harpsund/Saltsjöbaden. A staged photograph of a toast with the three glasses used at dinners after historically important political compromises in the history of Sweden. 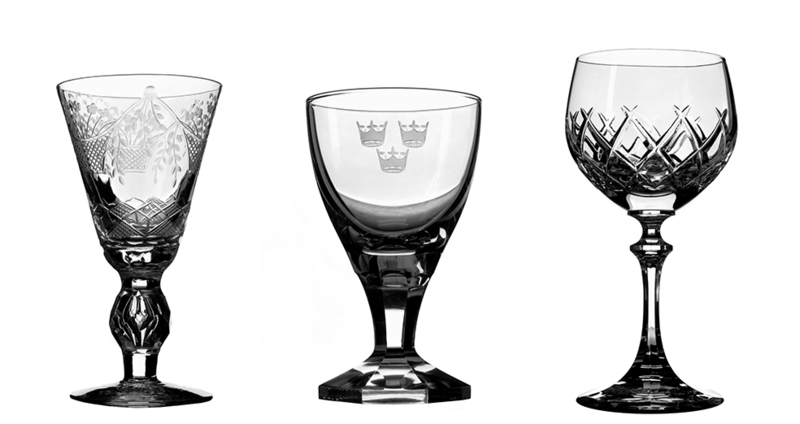 The form of the glass is the result of a three-dimensional compromise between three different glasses (please see above image) that have been used at dinners following historically important political compromises in the history of Sweden; at the Grand Hotel in Saltsjöbaden in 1938, the country residence for the Prime Minister of Sweden at Harpsund in 1955–1963 and the Royal Haga Palace in 1973. Glasses from Grand Hotel in Saltsjöbaden, the Swedish Government's official dinner service at the country residence for the Prime Minister of Sweden at Harpsund and the dinner service of the Royal Haga Palace. One glass from each place of a historical compromise was borrowed (not without some difficulties since one glass belongs to a royal palace and another to the Swedish government's official dinner service), photographed and scanned in a 3D scanner. 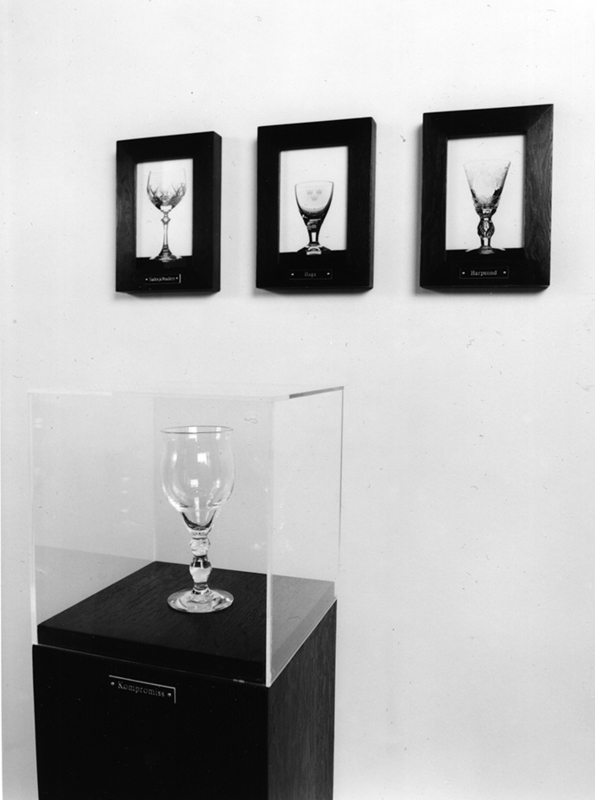 The three glasses were then digitally merged together into one 3D glass model, which was subsequently used as a template for a mold which was lastly used for the hand blowing of the glass at the glass workshop at Konstfack, University College of Arts, Crafts and Design in Stockholm. "Still, two segments stand out. [...] Wrange has collaborated with Spetz-Holst Architects to design "Compromise House," a wickedly hilarious fusion of a single-family home and a modernist apartment, complete with "The Half-Size-In-Between Floor," a space-saving feature also known as the John Malkovich floor. […] Cheeky humor, flashy production values and pop graphics intensify each work's marriage of sensible agendas and dystopian nightmares. Unfortunately, the exhibition lacks the same intensity, focus and decisiveness."